With Tabs Studio, you can better manage all open documents in Visual Studio, grouped and organized most efficiently in a document well. This Visual Studio extension supports VS 2019/2017/2015/2013/2012/2010, SSMS and will especially come handy when you open many tabs at once. Improve your productivity in Microsoft Visual Studio IDE always seeing all the tabs and having relevant tabs close to each other. Tabs Studio automatically creates multiple rows of tabs when needed and groups tabs with the same name. Visual Studio 2019/2017/2015/2013/2012/2010 and SQL Server Management Studio 18/17/2016/2014/2012 are supported. Visit the Tabs Studio home page for more information. 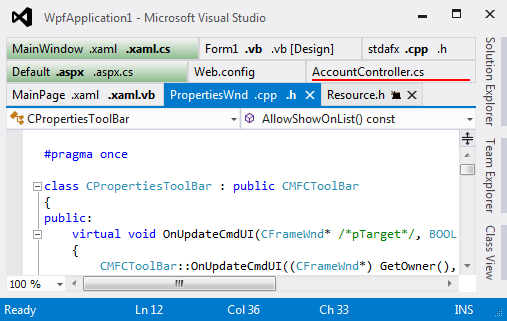 Find more Visual Studio extensions at the Vlasov Studio site.